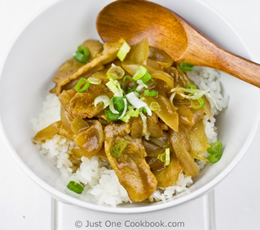 This curry recipe is simple and quick since the curry doesn’t need to simmer for a long time. Have dinner ready in less than 45 minutes with this dish brought to us by Nami from Just One Cookbook! Serve over rice. In a large non-stick frying pan, heat oil on medium high heat and sauté onion. When onion is getting soft, add the meat and cook on medium high heat until no longer pink. Add dashi stock and bring to a boil. Skim off scum and fat from soup, and turn down to medium low. Add Japanese curry roux and mix until completely dissolved. When the soup starts to thicken, add soy sauce and mix well. 6. In a serving bowl/plate, put rice and pour the curry. Garnish with green onions. Serve immediately.